How to create a sign-up form for your website? 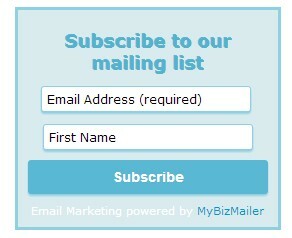 Looking for an easy way to create great looking sign-up forms for your website to integrate with your MyBizMailer account? This article will walk you through the step-by-step process of how to create sign-up forms that can be used on your website (including wordpress). 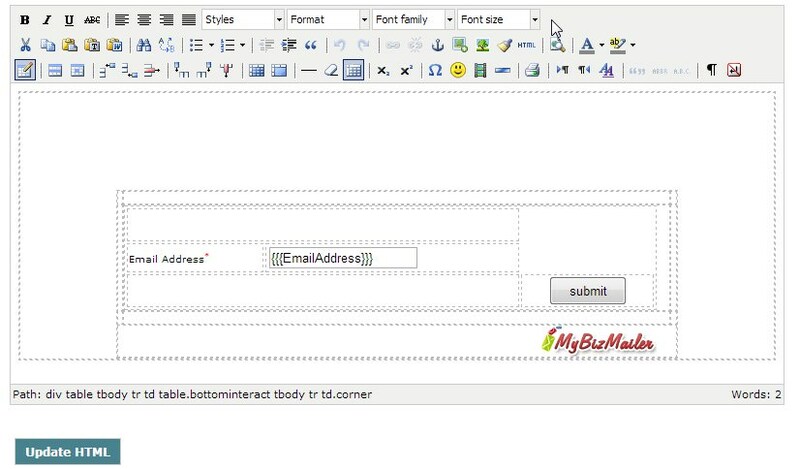 Hover over the "Forms" section of the menu bar and choose the "Create Form" option. You will then be taken to the "New Form Settings and Fields Page" where you'll setup the main functionality of your sign-up forms. 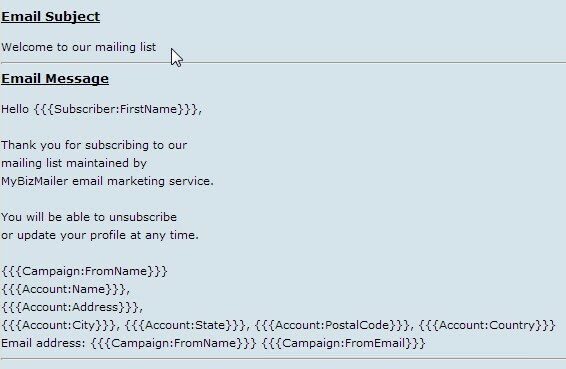 Fill in a Name for this form, a description of it as well and select either the Double Opt-In or Single Opt-In process (We recommend the Double Opt-In process). 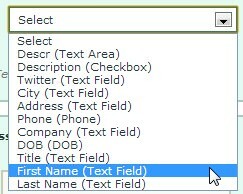 Any or all of the fields that you have selected can be made into "required" fields. 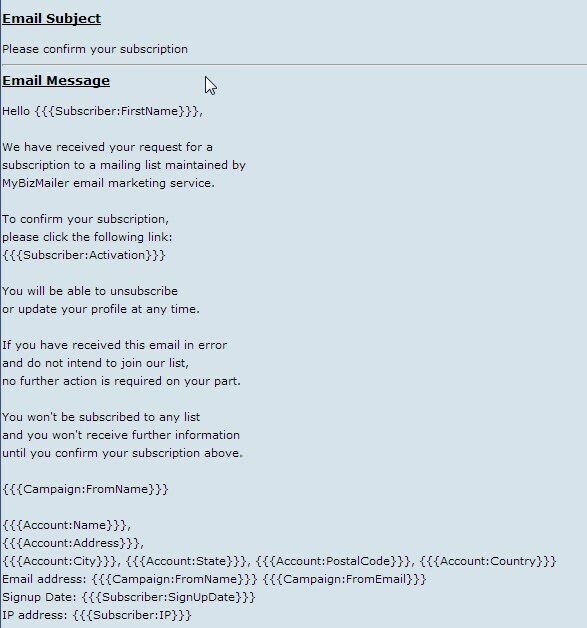 What this means is that your subscriber MUST fill in these fields in order to sign-up to your email list. Please select which fields that you want to make required. 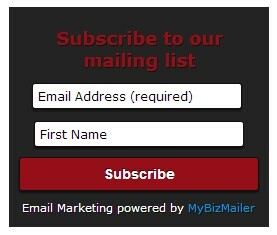 In the next step you will select the mailing list that you'd like to add your new subscribers to. That's all the fields and options for this page. So once you're done click the "Create Form" button. 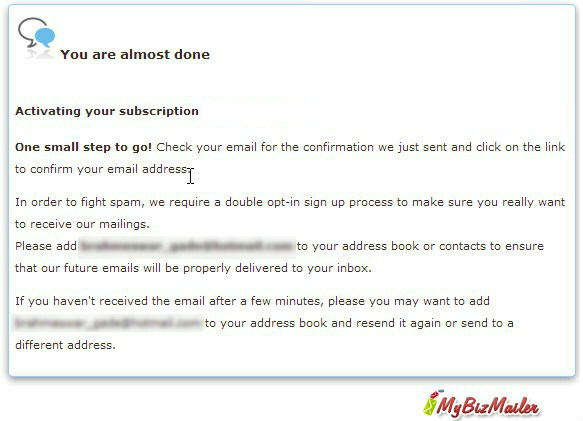 Stage 2: Subscriber sees an "Almost Done" message letting them know to check their email. They're to look for a confirmation email from you in their inbox and to click on the link that's within that email to confirm they actually want to hear from you on a regular basis. So now lets go over these steps one by one. We'll actually take care of the designing and styling of these Opt-In Forms below in the "Designing the Actual Embed Form" section that's after this one. This message can be edited to your liking. Just click on the edit option of the Activation Message section. Remember that you'll have to create this page yourself if you choose the "Link to your own page" option. 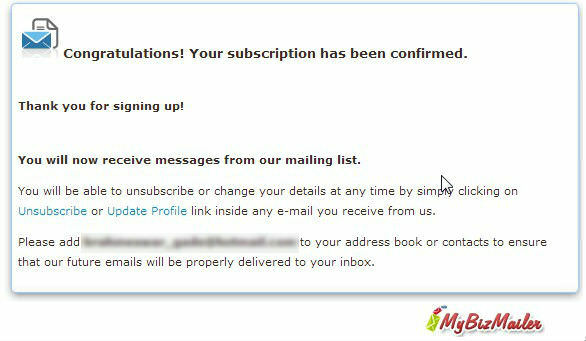 This is the 1st email that your subscriber will receive from you during the signup process. It contains relevant information about where they signed-up from and what actions to do next. Here's an example of the default message. This whole message can be edited however you like. Just click on the edit option of the Thank You (Double Opt-In) section. This whole message can be edited however you like. Just click on the edit option of the Final - Thank You Page section. And again, this whole email message can be edited to however you like. Just click on the edit option of the Welcome (Opt-In Confirmation) section. At first this 5 stage process may seem like a lot but it's essential to helping you maintain a clean and responsive list. As well this double opt-in method is standard practice right across the board now and helps you keep your complaint rates low. In the very least each and every form you create has its own stand alone web page that you can point people to. Check out the screen shot below of a minimal design version of this page or go to http://public.mybizmailer.com/02iu0y44/subscribe.aspx for an example. The good thing about this is that it's quick, and done for you. 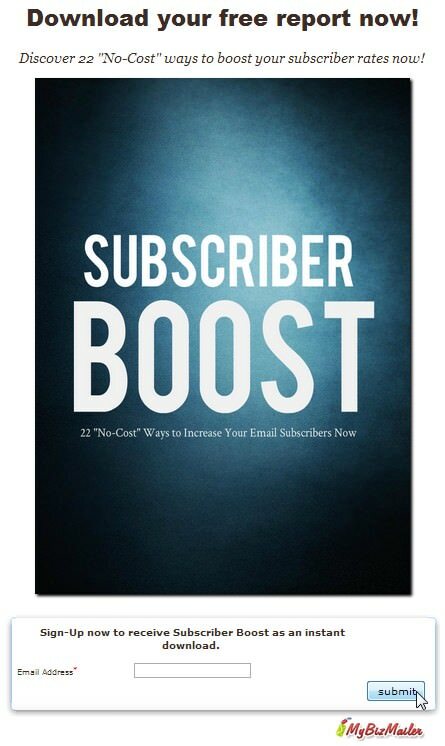 All you have to do is point your potential subscribers to it. All the elements on this page can be modified and styled easily using the WYSIWYG editor. All you have to do is click the "edit" button in the "Subscription Signup Page" section and you'll be taken to the editor. This option generates a simple text link code that you can paste anywhere on your site. All you have to do is key in the text that you'd like made into a hyperlink in the "Link Text" box, click the generate button and then copy the generated code and paste it anywhere you like on your website. 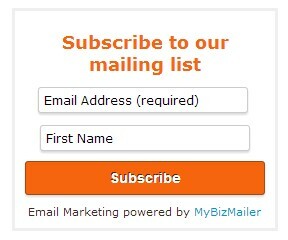 The Opt-In Box is one of the most popular ways to have people sign-up to your newsletter. 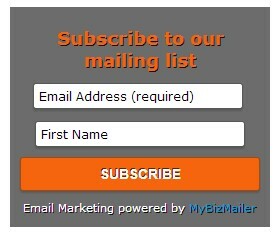 You've probably seen these opt-in boxes in the sidebars of a lot of the blogs you read. With the Opt-In Box Generator you can now easily generate a block of code that then be quickly embedded anywhere within your site. 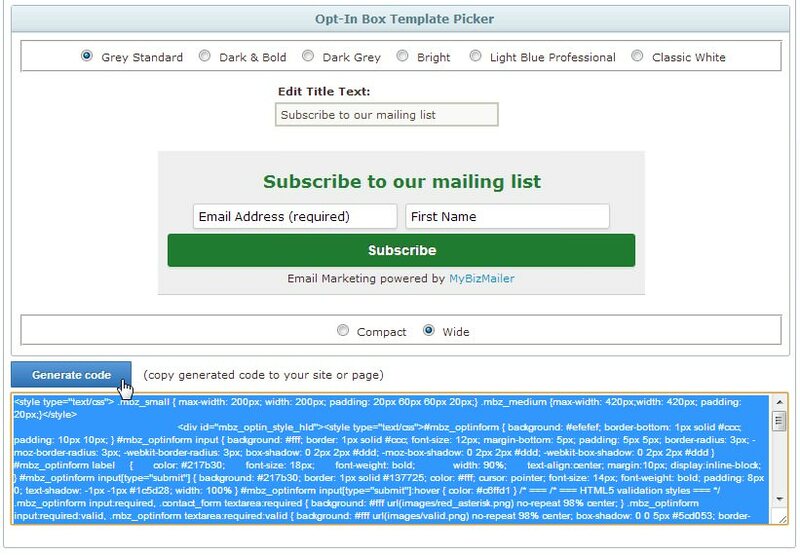 All you have to do is choose the text that you'd like to display within your Opt-In Box and then click the generate button. 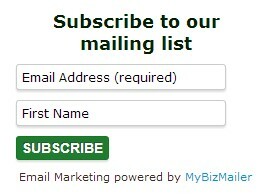 We've got a lot of new updates in store for MyBizMailer over the next coming months. One of those updates that's been a long time coming has been a refresh and update to our Signup Forms. So the whole team is excited to let you know that we've got six new Email Signup Form templates that you can use right now on your site. These six new opt-in forms are super-easy to place on your site. You can quickly select and generate the code and then copy and paste it into the sidebar of your website or the bottom of your blog posts. There's two size options for the new forms - compact or wide. Here's a look at the Standard Grey Opt-In Form in the Wide format. 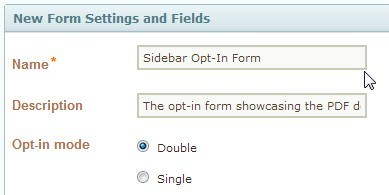 With the new Opt-In Box Template Picker you get the option to select from 6 different signup form styles. You can also choose "compact" or "wide" size options. 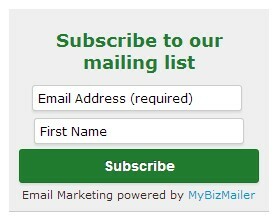 Don't like the "Subscribe to our mailing list" message? You can easily edit it as well. Just begin typing in the "Edit Title Text" input area and you'll see your changes right away. After you've selected the Signup form style you like and editted the title message to one that works for your site click on the "Generate Code" button. Copy the text that's outputted and place it on your site. So there you have it. The complete process to creating and embedding a signup form for your website.